Easily set any color to transparent in your Modern Editor design. With background images: Set a transparent background color so that your background image can be seen through a color band. With fonts: Set your font color to transparent to hide the font. Transparent colors have great support across most email clients. Of course, as we typically find, Outlook does not support transparent colors well. If there are email clients that do not support the feature (like Outlook), the email client will simply show an opaque solid color instead of a transparent one. 2. Click on the block you would like to edit colors for (text, image or container). 3. Select the STYLES tab. 4. 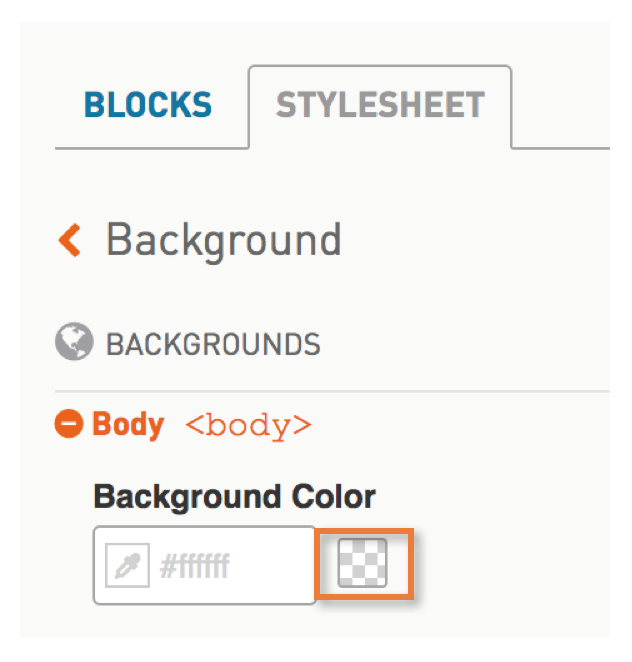 Select any element where there is a color option, such as the container or font. 5. Set the color to transparent by selecting the transparency box. You can follow those same steps to set transparency globally under the email's STYLESHEET. Click on the STYLESHEET tab from the edit content panel (left side of the editor).